As I write this blog I have just finished two of the most difficult sessions I have done physically for quite some time- both boxing sessions. I am without question pushing myself and no doubt getting in better shape than ever. This blog will give some of my reflections on how I think recovery can help improve the gains I am making. Let’s look at the training first- for all of you out there curious about what I’m doing. 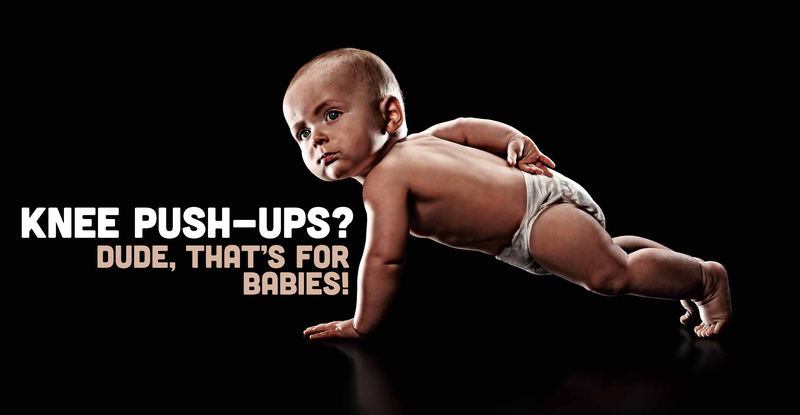 In my opinion the volume is a little high on the press up front- 200 press ups total. This is always the challenge of sports like boxing and tennis which have a lot of repetition in the forwards direction- so I needed to make sure I work on the pulling direction in my gym sessions. This was my fourth session and today my coach got me into the ring to do some sparring. I didn’t realise but I had asked if we could train at 11am which is the same time that his ‘regular’ fighters come in for sparring. 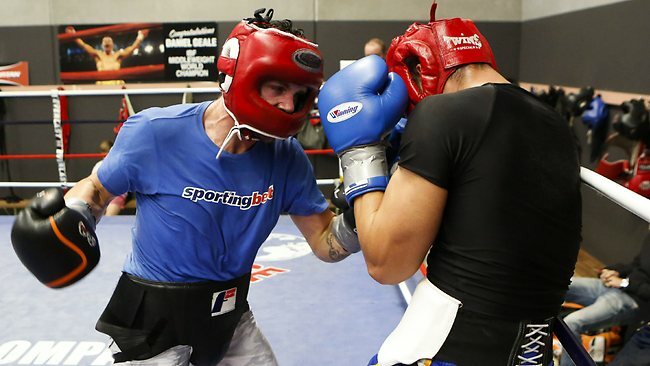 The fighters were asked to come in and give me some sparring practice. I heard him utter the horrible words- ”go light, he’s a beginner. But if he drops his guard give him something to think about.” I was wearing a head guard for the first time, but they were without one. I had 3 x 3-minute rounds with 1-minute between, and a new opponent each time. I then had 10 minutes to ‘reflect’ before I had to do it again for 3 x 3-minute rounds, again with three different opponents. On one hand I felt pleased that I was able to get through six rounds, considering my fight will be for three. But at the same time the reality has hit me because it was incredibly hard to keep throwing punches for three-minutes. I was struggling to get my combinations away, and also struggled to keep my guard up when they would counter. Don’t get me wrong, they put in a few punches to the face and body but if they really were going for it, I’d be in trouble. I have dropped to 75kg but I’m pleased because I’m still able to deadlift 90kg for 5×5 pretty comfortably. Not strong by elite standards but a good benchmark for me. 100kg is normally where I like to get to and still plenty of time to hit that target. So in conclusion Training is going well. I am training 5-6 days a week- single sessions. It’s more than I normally do! But despite exercising more frequently, and eating more strictly than I normally do….and I mean super strict, I haven’t got as lean as I would like. I will qualify that last statement because on this occasion I haven’t taken skin-folds or even done a bio-electrical impedance test. I have stuck with girths and photos. I am currently around 75kg after 3 1/2 weeks strict eating and training around 5-6 times per week. This represents a weight loss of around 3-4kg. But please don’t put too much stock on the weight loss- most of that will be water from restricting the grain based complex carbohydrates. Why do I say don’t focus on weight loss? With my clients who are trying to get more lean, I normally say to my clients ”please don’t get disheartened” if they are seeing a similar or even smaller amount of weight loss to mine above. So many people have been lead to believe that the best way to measure progress is through weight loss, rather than measuring fat loss. I’ve had clients who have completely transformed their bodies over 90 days and yet the scales have only dropped by 1kg. In some cases, your body can be burning fat while the scales are going up! This can be hard for some people to comprehend because we’ve become so used to measuring our bodies on scales. But if you’re training and eating right, those extra numbers on the scales do not mean you are gaining extra fat. You will actually be building lean muscle. Also when you consume carbohydrates they are stored in the liver and muscles as glycogen and more glycogen means more water in the body which can equal outrageous gains on the scales. I hear stories all the time from my clients who wake up and weigh themselves every single morning. More often than not, this leads to instant negative feelings and this can set the mood for the rest of the day. It’s massively disheartening and can kill your motivation. This isn’t the way to live and that’s why I encourage all my clients to use progress pictures rather than the sad step to measure their success. The best thing I can advise is to take a selfie of yourself in your underwear every 2-4 weeks, probably every 4 weeks. If you work hard, stay motivated and are consistent with your training and nutrition, you will see positive changes in your body that the scales will never show. Progress photos are also more reliable than the mirror, because our minds can play tricks on us, especially when we’re feeling low, and tell us that we are not making progress. But in my case, I’m taking photos and seeing a bit of change BUT my girths are pretty much as they were. So I thought I would think about my stress levels and quality of sleep and overall recovery. It got me thinking. Could the quality of my sleep and the level of my overall stress influence my fat loss? I happened to come across a great article on T-nation which I will summarise. If you want to read the whole link you can HERE. Chronically high or low levels are bad for you! Calories don’t control metabolism, hormones do. And when it comes to hormones, the stress hormone cortisol is critical. Not only can stress hormones impact how many calories you eat in a day, they can also impact the quality of calories you choose to eat and even influence how, and where, those calories might get stored or burned from. During exercise, cortisol works with your other fat burning hormones, the catecholamines (adrenaline and noradrenaline) and growth hormone, to increase fat release. Cortisol- (during exercise and fasting)- >fat burning- increases the activity of hormone sensitive lipase (HSL), the body’s chief fat releasing enzyme. High cortisol levels when you’re not exercising? That’s a different story. When cortisol is “socializing” with insulin instead, it has the exact opposite effect. Cortisol (during eating)- > fat storing- increases activity of lipoprotein lipase (LPL), the body’s major fat storing enzyme. Insulin will be increased and increase cortisol’s fat storing properties. But what about stress during rest? Now I am starting work at 7am or 8am most days, including weekends and struggle to have a proper DAY OFF- days are usually also finishing at 7pm and often I’ll fit my admin around coaching which can start at 7am and finish at 7pm. If you’re a savvy fitness enthusiast, when you think stress you think cortisol. If you’re really on your game, you’ll also think catecholamines. But there’s one more hormone produced by stress that even the most advanced experts know little about – NPY. NPY is involved with hunger in the brain as referenced above. But cortisol doesn’t just impact brain NPY, it also impacts body NPY. When you’re under acute stress you release catecholamines and cortisol. When you’re under chronic stress you release more NPY. When catecholamines and cortisol are “socializing”, they help you burn fat. But NPY makes you gain fat, especially when it’s hanging around with cortisol. When NPY is released in large amounts it causes immature fat cells to grow into mature fat cells. Chronically high cortisol makes the body more responsive to this fat storing action of NPY. Cortisol is made in the adrenal glands mostly, but there’s one other place it can be made – belly fat. The deep fat of the belly, called visceral belly fat, contains an enzyme called 11-beta hydroxysteroid dehydrogenase (11-HSD). This is an enzyme that converts inactive cortisone into active cortisol. This means belly fat can produce its own cortisol! There are many situations where stubborn belly fat remains despite best efforts with diet and exercise. Sometimes an extra hour in bed, to lower cortisol, may be a better strategy than an extra hour on the treadmill. How do you manage cortisol level? When it comes to eating frequency, don’t get caught up in what the research zombies are telling you. Let research refine your approach, not define it. There are many approaches that can work. Eat frequently enough to keep your HEC in check. For some this may mean lots of small frequent meals. For others it may mean fewer smaller meals. Short intense exercise, or exercise that’s weight training dominant, and slow relaxing exercise are best for cortisol. In the case of short intense exercise, cortisol is elevated along with growth hormone and the catecholamines. That’s good for fat burning. Plus the shorter duration may mean less compensatory hunger later and less chance of going catabolic. With longer-duration moderate and intense exercise, cortisol can easily dominate over the growth promoting hormones and be associated with more post-workout hunger and cravings and less anabolic potential. Is this the reason sprinters and marathoners look so different? Probably not entirely, but after accounting for genetics, it’s not a huge jump to suggest this mechanism is playing a role. Another great way to lower cortisol is finishing workouts with slow relaxing movements like leisure walking. I’m not sure why this isn’t used more often, but slow walking is one of the best approaches to lowering cortisol. And it has been shown to be even more impactful when done in a nature setting. In this blog I will give some updates on my movements over the last few weeks starting with my visit to London to attend the Pelvis Biomechanics two-day workshop with Biomechanics Education. Then I will give a few more updates on my training progress. I first met Rachel and her Biomechanics Education team at the elite Sports Performance Expo 2015 on June 10th. 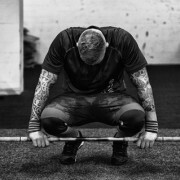 I was quickly sold on the power of the training system as I was given some almost instant relief from some long term hip discomfort that I have been managing for 14 years. I have made a few educated guesses that when I was 20 I had a major trauma to my pelvis during a weight lifting exercise where I squatted too much on the smith machine. I think it caused a pelvic dysfunction known as a rotating pelvis and a functional leg length discrepancy. After getting sciatic nerve pain and later significant hip discomfort with various muscles appearing to go in spasm I had almost given up going to see physios and osteopaths to perform various joint manipulations and soft tissue manual therapy. It was relieving the discomfort but never removing it. But when I went to see one of the Biomechanics Education Coaches the Expo they quickly assessed I had a functional leg length discrepancy (using Downing’s sign test) and gave me a static lying down leg press muscle release to release the piriformis. After a few days of doing the muscle release I felt noticeable improvements in my discomfort. So I started to read up more on Biomechanics education. I like the modular system that then informs our screening and exercise correction programmes. I like the way that the screens allow you to biomechanically evaluate your client and provide client specific, corrective exercise. As you can here in my video below, it’s the client specific corrective exercise intervention that I was looking to learn more about to make me a superior fitness professional without needing to train further in clinical /therapeutic practices. Martin Haines- Founder Intrinsic Biomechanics Systems gives his views here on a classic debate- are my knees rolling in because I have weak glutes? We discussed these topics and other ones like it on the workshop and the moral of the story was to not be fixed on one line of enquiry. I have learnt loads more about Functional Anatomy and debates like the ‘week glutes’ one above are clearly not so black and white when you know that there are several reasons why a major muscle may not be ”functioning properly”. It’s not so easy to just say a muscle is weak- it may be inhibited by a spasm of a synergistic muscle such as piriformis or a tightness in the thoracic spine. I am now learning not to accept the commonly held assumptions about what a test positive test shows you- look a little deeper and challenge the status quo. As a result of feeling better than ever in terms of managing my level of discomfort it has come at the best possible time. I have always struggled to perform dynamic exercise such as high intensity running, sprinting, jumping and so forth. So ordinarily I would be cautious about really ‘going for it’ with my boxing training. However, the last couple of days have felt pretty good. I wrote about my planned training in the last couple of blogs, the most recent one here. This week I did Variation 1 on Monday and Variation 2 on Wednesday. I did hypertrophy (weights) on Tuesday and a run today (see below). I will do Hypertrophy again on Friday or Saturday. Six-fold jumps (2 on left and then 2 on right-6 take offs on each leg) for 1 repetition. Comments: With these six exercises you can comfortably get through them all with minimal rest between in under 2-minutes. I was taking 1-minute rest between circuits and did two circuits. Next week I will do three circuits. Weights circuit (more emphasis on Strength) 30-60 sec on: 1-min off, with aim to get pulse down below 140 bpm in the 1-minute rest. Comments: I chose to do each exercise for 60-seconds and have 60-seconds between exercises. I felt 60-seconds was a bit too much rest so I might go for 40:20 to make it harder to recover. I gave myself the target of hitting 30 reps in as many of the exercises as possible. Today I did 400m repeats on the track. I did each repeat with 1-minute rest between them. As it was the first running session (apart from 5-a-side football for several years) I decided to take it easy to get in to it. Rep 4-6: 1:38 mins (50m fast-50m slow alternating intervals all the way around the track). Don’t forget we now offer Personal Training and Adult Group Fitness now! Come along and get involved. 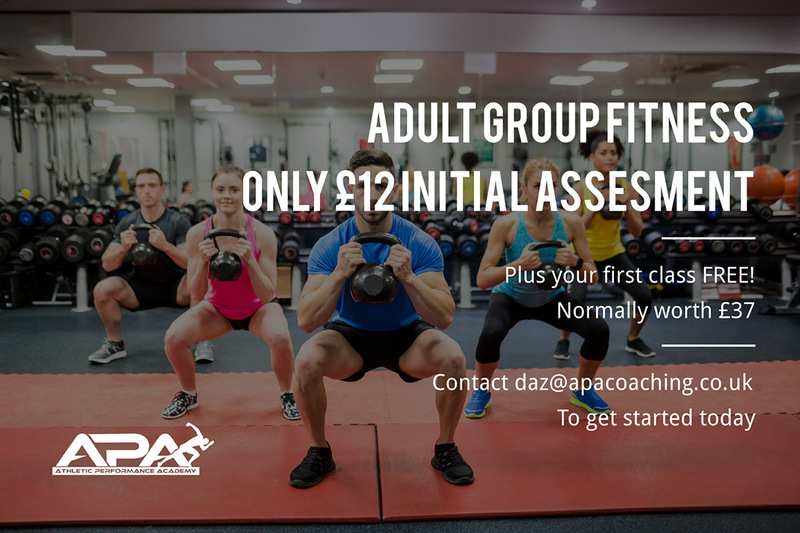 Email me at daz@apacoaching.co.uk if you’re interested in finding out more. As I write this blog I am struggling to lift my arms- yesterday I had a really tough second session with Team Complete Fitness Academy Head Coach Gerry Jackson. Check out a promo video of their facility here. I’ve booked myself in for 10 Personal Training sessions with him in the lead up to the fight which is on April 2nd. Having been involved largely in Tennis since 2003 it has been refreshing to get involved in training for a different sport. Boxers- fittest athlete of all sports? 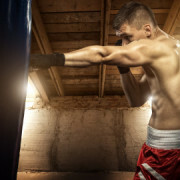 Boxing often gets put in the category of ‘fitness sports.’ Perhaps it would be impossible to really make a case for one sport being the ultimate fitness sport. Pure endurance sports such as distance running fully tax the aerobic system but how can you not admire the power and fitness of a 17 stone rugby prop covering the pitch over 80 minutes. Or a tennis player who stays out there for 4 hours having covered a few kilometres worth of sprints and high intensity running. Tennis is really an alactic sport ”which involves mainly the CP energy supplying mechanism, and followed by short phases of low intensity activity or rest intervals, during which the aerobic processes ensures the restitution of the anaerobic source.” Verkoshansky, Special Strength Training pg 196. Boxing is similar in that you also need this same alactic power. Therefore a big part of my weights training session is going to include a finisher with some work to improve my Maximal Anaerobic Power. Basically I’m going to shadow box with 0.5kg dumbbells in my hand 15-seconds maximal rate combinations x 6 reps per set with 2-minutes rest between reps and 2-3 sets. I want complete recovery so I can focus on getting as much out of myself in the 15-second bursts. 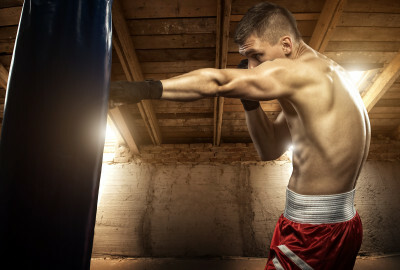 Boxing is 3 minutes of work but that work never involves complete rest. You might move away from your opponent momentarily to give you a second to catch your breath and drop your guard briefly to rest your shoulders. But really its all about being able to maintain a fairly high rate of work that undulates between higher and lower intensities without a break therefore you also need endurance. To improve my endurance I will also be doing a circuit instead of my sparing if for whatever reason I can’t train with Gerry. For example, Gerry is on holiday this week so I’ll be doing one of these on Monday and Wednesday. The main thing I have noticed that I don’t really train with tennis athletes is the demands of making high speed short contacts between opponents when striking. Throwing several high speed combinations in a row really taxes your speed strength. You also need a bit of explosive strength from the legs when moving the body in and out of the reach of your opponent. 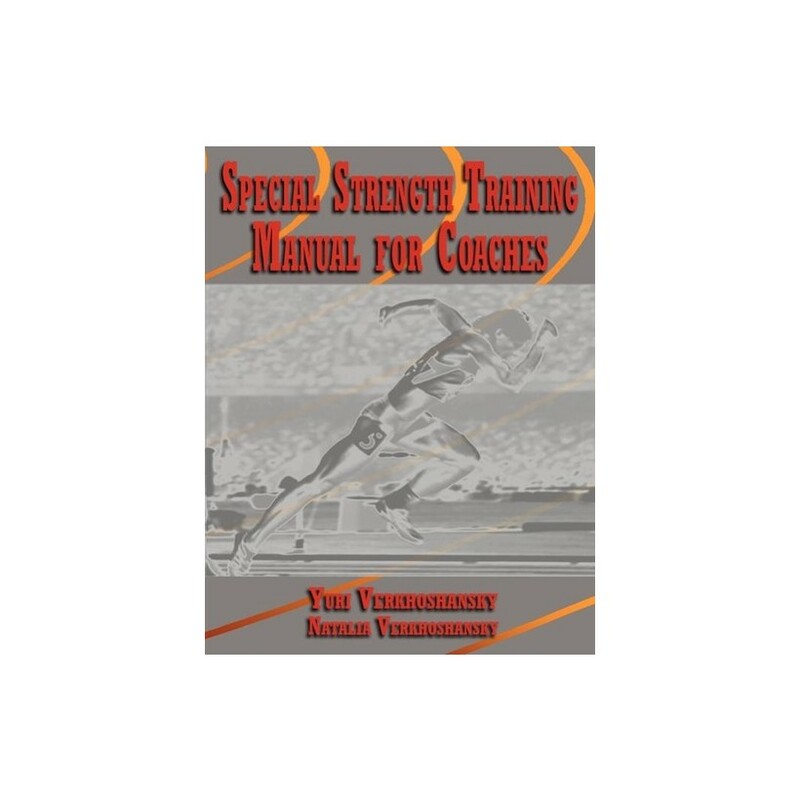 Tennis uses a lot more reactive power using the fast stretch shortening cycle during footwork and more hip dominant explosive power during sprinting to wider balls. Therefore my legs feel strong but my arms are absolutely wasted from all the punch combinations using speed strength i don’t really train. In Tennis I guess I am guilty of sometimes holding the athletes hand through their training, although I have certainly got better in recent years. Gerry was just like I expected- in session 1 he said go and warm-up and I’ll see you when you’re finished. He will expect you to take care of business yourself and won’t sit around to watch you do it. Gerry’s warm-up is like a work capacity circuit, something that Brendan has been an advocate of for a long time, no doubt influenced by his own martial arts experience. Just doing that was very tough for me. It made me think that as much as I preach that getting stronger will also raise your work capacity anyway, there’s a big difference to lifting heavy weights and actually doing direct work capacity training. Again, just another example of how you’re building in more and more work capacity, because after my 6 minute run I had to do the warm-up circuit!! In the first session we did 3-minutes on the bag x 3 with a 1-minute rest between. Gerry asked me to just do what I want to do and he will use that to evaluate my technique and make refines during our sessions together. The main thing I was working on was coming towards and away from the bag. If you come out and then come back in you have more space and momentum to throw your punches. I also worked on recoiling the punch more quickly so you don’t just strike and then slowly bring it back. I did this bag work on both my first and second session. On the second session Gerry asked me to do the final round using a combination of left jab- right cross- left hook- right cross. 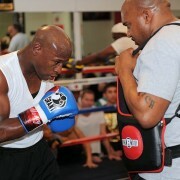 In the first session and second session we did 3 x 3-minutes on the pads. The first session we focused on mainly single and double combinations, and a little bit of defensive work. In the second session we did another two rounds of 3-minutes as per the first session. However, it was noticeably harder because he made me throw more combinations and also at the end of the second round made me do a jab finisher- doing singles, then doubles then triples all the way up to 10!! In the final round we did something that was one of the hardest things I have done. Gerry called it the ”Cry Like a Baby round.” Basically in the final round Gerry would push me all around the outside of the ring and said I had to keep working the body and if I didn’t get a strike in, he would hit me. Basically for 3 minutes I was just hanging on to the ropes and trying to move around but I couldn’t get any space at all and a few times he gave me a few strikes to the ribs which almost winded me. In 8 weeks time I will be doing my first competitive boxing match. As a professional strength & conditioning coach I spend all my waking hours helping other athletes achieve their goals. I felt it was time to invest as much in myself and work towards my own goal. So I’m taking part in the Luton White Collar Boxing April 2nd 2016 to raise money for Cancer Research UK and I’d really appreciate your support. JustGiving sends your donation straight to Cancer Research UK so it’s a quick and safe way to donate. I thought it would also be interesting to tell you about the training I am doing to get myself in peak physical condition for the fight. As attributes go I have always thought I was quick without being powerful so I figured it was as good a time as any to live my own Rocky dream. Since becoming more and more consumed by running a business and a team of staff I have found my number of hours of regular activity have dropped to around one regular 5-a-side football match and 2-3 gym based weights sessions. Nutritionally I have not been periodising my diet and tending to eat complex carbohydrates and/or sugar at each main meal and most snacks. As a result I am around 18%-20% body fat and 80kg at 184cm. It’s interesting because if I spare using the pads with some of my athletes who are also around 80kg you have to remember they are around 5-10% body fat. So they have much more lean mass than me- I’m closer to 20% body fat. So even though we weigh the same I have twice as much useless fat on my body. It definitely shows as they pack a bigger punch. You dropped weight before right?? If you remember in the Autumn of 2012 I was around 16% body fat and got down to 9% following a programme at UP Fitness. I wrote a blog about it HERE and HERE. I wanted to learn more about the process having been inspired by the story of the Fitness editor of Men’s Fitness who showed it’s possible for every day people to achieve cover model physique. This time I am looking to do it for performance gains. My theory is if I lose around 10% body fat or around 8 kg and gain a couple of kilograms of lean mass I will come in at a fight weight of around 74kg. I will keep doing the football and the 3 weights sessions. 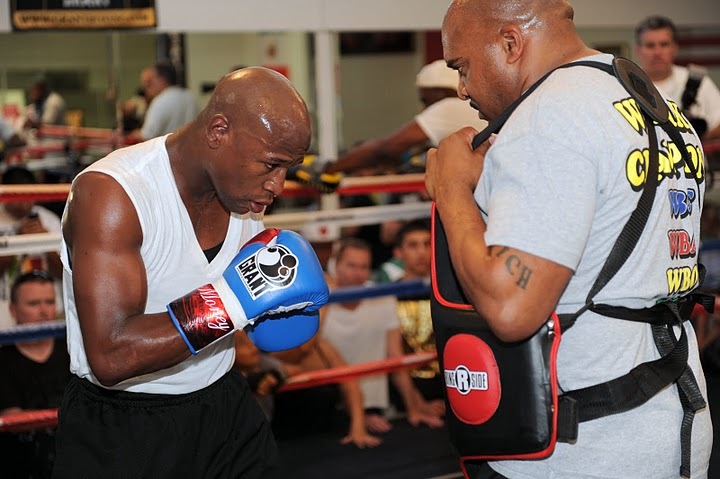 I will also add in two boxing sessions- one for general fitness and one for sparring. Strength is my biggest area of improvement. I also feel I will need to do some muscle mass hypertrophy work, especially after the first two weeks of very low carbohydrate. I will start with a strength block. This is a good opportunity to get started with my primary goal of gaining strength. I have also found that from experience I cope better with lower volume higher intensity strength work when I am on my lowest intake of carbohydrates. I can get stuck into this straight away as most of my normal training has prepared me to cope with the loading at the start of the phase. If I were a novice trainer I would recommend starting with some anatomical adaptation muscular endurance type work in the 10-15 or even 20 rep region, before going into hypertrophy. I have to thank Charles Poliquin whose principles were utilized when I first went to UP Mayfair in 2012. That lead me to later read the work of Mike Rousell who I found through Peak Fitness, as well as John Beradi through Eric Cressey. While the specifics are particular to each expert I refer to above, I would say the principles are the same. In essence you need to think about your approach to nutrition being modified according to whether the day is a training day or a non-training day. I have known the rules for years but chosen to break them. But for many people who are training recreationally for general fitness and health these rules are not widely known or applied incorrectly. The basic rule is eat complex carbohydrates when your body is more sensitive to insulin. At this time you can have a portion of complex starchy carbohydrate (such as oats, potatoes, cereals, pasta etc) and/or a simple sugar. Usually any sugar would come in the post workout snack (such as a shake, sports drink or piece of fruit etc). The starches would usually come in the meal after the workout. Where athletes are looking to maintain lean mass they will usually have a single meal containing starches. Where they are looking to increase lean mass they will have the two post workout meals containing starches. The rest of the time your carbohydrate intake should come from green leafy vegetables primarily and fruit in moderation. So on a training day you would probably expect your meals with starches to be around 60-80g carbohydrates per meal and a total amount of carbohydrates to be around 250-300g per day. By limiting your intake of starchy carbohydrates to breakfast and the rest of the meals to green vegetables you can expect to intake around 180g carbohydrates on your non-training days. This is based on your non-starch meals containing around 20g carbohydrate. This would enable you to main lean mass without gaining excessive fat mass. So what if you’re looking to lose fat mass? How do you do it? Well that depends on when you are looking to achieve this goal by, as there are short, medium and long term strategies. Popular ‘diets’ known as crash diets are often not sustainable and are calorie restricted. People should only do them in the short-term and only if they fully understand what it is doing to the body. As humans I think we should always be looking to achieve sustainable long-term lifestyle habits. 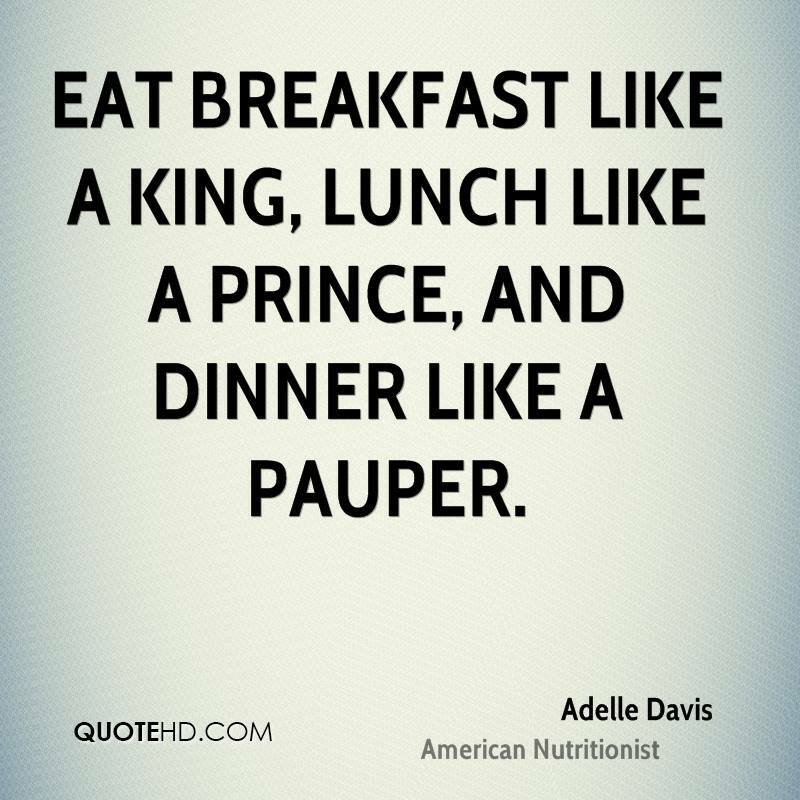 For the general public if you are not engaged in physical activity then the old adage breakfast like a king, lunch like a prince and dinner like a pauper, holds true. But you need to think of the message being applied to quantities of carbohydrates rather than quantities of food per se. You also need to think of this message being applied to non training days. Eat your biggest intake of carbohydrates at breakfast as that is when your insulin sensitivity is highest. Due to the overnight fast while you were sleeping, your body is more likely to store the carbohydrate as glycogen than store it as fat. If you simple follow this regime and only eat fruit and vegetables at other times you can expect to make some improvements in your body composition but it may take several months. Is there ever any time when the rule doesn’t apply? Yes- Training days: It would be okay to eat more starches in post workout meals on training days- and if that training happened to be in the evening then it would be better to eat more after training (dinner) than more at lunch. But when there are time pressures there are certain strategies we can use, which while not sustainable, will enable us to kick-start a metabolic shift in our sensitivity to insulin and the way we metabolise carbohydrates. EVERY DAY regardless of whether you are training or not is a low starch day!!! Low can be anything lower than 100g per day. Therefore I will be doing a 2-week extreme carbohydrate restriction phase of 20g per day, which I hope will increase my insulin sensitivity. I will lose water due to depletion of muscle glycogen stores but I hope the strength training will help me to retain my lean mass. During this programme I will not have carbohydrates at breakfast to maximize the effect of the fat loss. So day days I am playing football or doing boxing sessions I will ramp up the carbohydrate intake to include oats at breakfast and starches in two post workout meals. I have been following this diet for 3 days. A few comments in case you want to follow it for yourself. Eating Lean protein at every meal is expensive. 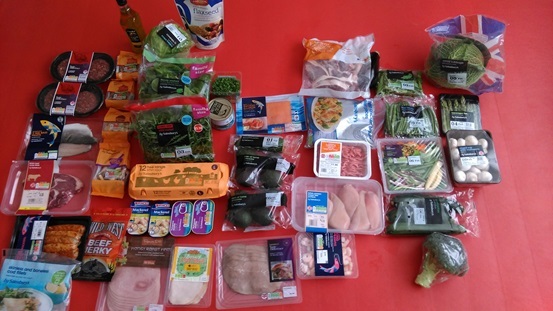 £96 for about 7-10 days food. Eating lean requires a lot of advanced preparation- cooking and packing all your meals in advance. Here was my food shop last Sunday.